In recent years the development and widespread use of free, reliable communication software have allowed New Century to introduce online study as an option. 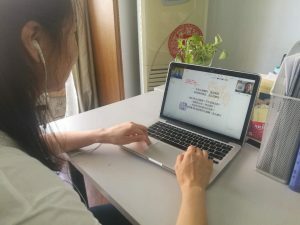 Using the internet, New Century connects with learners around the world to bring high-quality Chinese language study into their homes or workplaces. Online classes can be scheduled Monday-Saturday, 8am-9pm China Standard Time (CST). Internet students have the same experienced teachers as our in-China students, using our proven study materials. You can start with internet classes before you come to China, or use them to continue your studies after you leave Tianjin, going on with a program you know you can trust. Wherever you are, you can keep improving your Chinese language skills and cultural understanding. One half-hour session is offered free to make sure this approach suits you, and that your internet connection speed is sufficient. Since most online learners study from a distance, a payment system has been created to facilitate convenient payment. Instead of making monthly payments, online students purchase class hours in blocks of a minimum of twenty hours before taking the class. Once class hours are purchased, New Century will track these hours in light of classes taken and provide students with a monthly update of remaining purchased class hours. When class hours have all been used, the arrangement can be made for the purchase of another block of class hours. Cancellation and rescheduling policies allow students to cancel or reschedule up to 25% of a month’s scheduled classes without penalty, as long as requests are made with at least 24 hours advance notice. Canceled class hours will be credited to the following month, at which point they can be scheduled as hours already purchased. For those interested in the online study, feel free to contact us to arrange a free thirty-minute trial lesson!